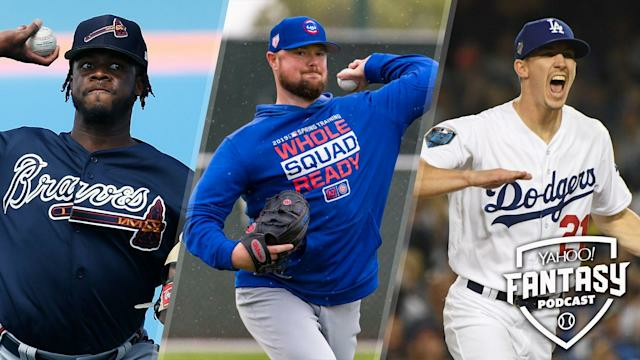 MLB Opening Day is just a couple short days away and there's still time to draft your fantasy team (or draft your second, third or fourth one). Scott Pianowski is joined by Yahoo Sports' resident Canadian, Fred Zinkie, for a conversation about some last-minute news items and strategies to consider before the first pitch on Thursday. They start off discussing the newly announced closer for the Arizona Diamondbacks, Greg Holland and the larger tactics surrounding finding saves, closers to target and whether or not to just punt on closers altogether (4:20). Scott and Fred give their sleeper MVP and Cy Young picks including a pair of guys from the Minnesota Twins who could make waves in a weak division: José Berrios and Eddie Rosario (14:55). The conversation evolves into a discussion about some NL starting rotations that are a bit difficult to parse in the Braves, Cubs and Dodgers (21:30). It wouldn't be a baseball conversation without a discussion of Toronto Blue Jays phenom Vlad Guerrero Jr. and where he's being drafted in relation to his value (30:35). The guys move to the NL East to chat about two oft-injured pitchers in Noah Syndergaard of the New York Mets and Stephen Strasburg of the Washington Nationals (34:00). Scott wraps up the show with his draft of the week and he tosses it to Fred's homeland with a draft of all things Canadian: lots of music and puck, and we apologize if you don’t like it (36:25).